Southern Grind is the pet project of country musician Zac Brown. Zac has a strong interest in pocket knives, and he apparently created Southern Grind in part to explore that interest. Southern Grind produces their knives in house, in the USA, and the knives feature a number of design decisions that stray from the beaten path. What I find especially interesting is that they make their custom own hardware. Southern Grind’s first folder was the Bad Monkey, a quirky take on the large linerlock EDC knife. For whatever reason I never pulled the trigger on the Bad Monkey, but with the release of the smaller, lighter, and more refined Spider Monkey I finally moved forward. The Spider Monkey features an overall length of 7.50″, a 3.25” blade, and it weighs 3.2 ounces. The Spider Monkey compares favorably to Sage 1. The blade on the Spider Monkey is a 1/4″ longer than the blade of the Sage, but the handle is the same size. While the original Bad Monkey was a large utility folder with a 4″ blade, the Spider Monkey is much smaller and geared towards the EDC crowd. The blade is a gently sloping drop point shape with a prominent thumb ramp and small swedge. This knife also features a high hollow grind and has been finished with a polish and stonewash. This is a classic no-frills blade shape, that gives you a little of everything. The tip is fine and ideal for piercing cuts, there is some belly, but also plenty of edge for draw cuts. The grind is thin and the knife slices well, and the edge has been applied neatly. This is a capable blade, ideally suited for daily tasks. I used my knife to open boxes, cut fruit, and help out with chores around the house. Southern Grind also offers the Spider Monkey with a tanto blade shape, a partially serrated version, and with an optional black coating. Southern Grind used S35VN steel for the blade, a good choice given the price point and intended use. I’ve written a lot about S35VN. We seem to see it crop up in more and more premium knives these days. I like how this steel holds a good edge, but is still is easy to sharpen. I prefer it over harder steels that are more difficult to maintain. I like how I can run this knife over a ceramic rod and bring it back to hair shaving sharp without a ton of work. The Spider Monkey features carbon fiber handle scales over titanium liners. The carbon fiber is contoured, and it features a ribbed texture that starts at the pommel and fades into smooth carbon fiber about half way into the handle. The handle is held together with custom hardware and pillars. The fit of all the parts is excellent. The profile of the handle is unique with its swayed back and large pommel, but it all works. Even the laser etched logo on the custom pivot is perfectly aligned. It is little touches like this that show the thought and care that went into engineering this knife. I am also not a fan of the proprietary body screws. While I can appreciate the fact that these are custom machined parts, you need a special tool to take the knife apart, and it doesn’t ship with the knife. I’d prefer torx hardware for ease of disassembly, or at least charge me a little extra and ship the knife with the necessary take down tool. The handle of the Spider Monkey may look a little boxy, but it is comfortable. The finger choil does a good job indexing your finger, and the rounded back corner of the handle is fits neatly into your hand. While the carbon fiber scales don’t offer tons of grip, there is some texture here. Plus, there is some aggressive jimping on the thumb ramp. I would dial that back or do away with it, but I know some people will appreciate the extra traction here. The pocket clip is perhaps the most novel feature of the knife. This is a shortened version of the clip you will find on a Benchmade or Emerson. This is something Zack Brown himself developed after being frustrated with longer pocket clips. This won’t be to everyone’s taste, but I think it’s cool. The clip works well. Retention is strong and there is no danger of the Spider Monkey slipping out of your pocket. If you don’t like it you could always swap it out with a Benchmade or Emerson clip. The Spider Monkey uses dual thumb studs to get the blade open. Again, we have proprietary hardware here, which is cool to see in this application. I found the action on my knife to be a little stiff, and because of the custom body screws I was not able to take the knife apart for a cleaning. I could flick the blade open with some wrist action, but that was it. The action is smooth thanks in part to phosphor bronze washers, but the blade doesn’t want to fly open like on some of my other knives. The titanium liner lock is substantial and executed wonderfully. Lockup is early and secure. There is absolutely no blade play in any direction, and the lock is easy enough to disengage when you are ready to close the blade. This liner lock works so well, I thought it was stainless steel. I bemoaned titanium liner locks in my Emerson Gentleman Jim review because the titanium liner lock on my knife (and in most Emersons I have handled) stick like crazy. Clearly, not all titanium liner locks are created equal, and this is a great liner lock. It is easily on par with my Sage 1. The Spider Monkey is a cool little knife. I have been intrigued by this company, ever since they arrived on the scene a few years ago, but I ended up liking the Spider Monkey more than I thought I would. It’s a great size and there are a number of details that set this apart from your typical slab construction liner lock folders. I like the stubby pocket clip, the custom pivot and thumb studs, and the contoured carbon fiber handles. In a way, this is how I would expect an Emerson knife to be made: beautiful construction, modern materials, and a stainless steel thick titanium liner lock that doesn’t stick with phosphor bronze washers. But like an Emerson, this Southern Grind knife has its quirks as well. The biggest quirk, and my biggest beef with the Spider Monkey, is that I don’t like the proprietary body screws. I have found that being able to periodically disassemble and clean my EDC knives is essential to a piece being a true “user” knife for me. I don’t care if I never disassemble my 888, but I need to be able to take apart a simple liner lock EDC knife like this. Still, the pros outweigh the cons with the Spider Monkey. Southern Grind is a young knife company, and they are coming out with some cool stuff. Plus, they clearly know how to make things. The tolerances are great, and the end result is a premium product. I enjoy this Spider Monkey and look forward to keeping it for long term testing and evaluation. In the meantime, buy it if you like the design. I can vouch that it is a quality tool. I recommend purchasing the Southern Grind Spider Monkey at Amazon, BladeHQ, and KnifeArt. Please consider that purchasing anything through any of the links on this website helps support BladeReviews.com, and keeps the site going. As always, any and all support is greatly appreciated. Thank you very much. Some knives never quite get their due. The community only has so much bandwidth for new product every year, and the criteria for making the transition from flash in the plan to fully qualified classic are hazy. We see not so good knives getting attention they don’t deserve, and good, even great designs collecting dust in obscurity a year after their release. While the fate of the Utilitac II isn’t quite that tragic, it seems like it’s well on its way to being forgotten. Which would be a shame, because it is a really good knife. Without even looking that closely, it checks a lot of boxes: great price, a lot of options, and a custom maker pedigree. But when you look closely, you see a knife that is thoughtfully designed, bringing a ton of consideration and character to budget knife design. One thing to note: the Utilitac II comes in a variety of configurations, some of which are so different as to essentially be different knives. There are two different blade shapes – a tanto or a clip point – and two different handles – rounded or coffin-shaped – to choose from. You can get either blade shape with either handle. My Utilitac II has the clip point blade and the rounded handle. The Utilitac II has a blade length of 3-7/16”, a handle length of 4-5/8”, and an overall length of 8”. It is made in Taiwan for Ontario Knife Company. The Utilitac II weighs 5.6 oz., which puts it firmly in the Mid-Size category. For me, this is about as big a knife as I’m likely to EDC. I don’t mind the Utilitac II’s dimensions. It’s an integral part of its character. You either like this size and shape of knife, or you don’t. 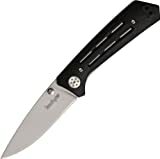 The Utilitac II was designed by Joe Pardue, son of Griptilian designer Mel Pardue. The younger Pardue’s design style is more flamboyant than his father’s, but still conveys the same overarching commitment to functionality that makes the Griptilian so likeable. The most eye-catching element of any version of the Utilitac II is the blade. Both the tanto and the clip point have exaggerated comic book proportions. The clip point is wide and curvy. It is almost reminiscent of the blade on the Spyderco Rubicon, albeit with a more aggressive tip and a slight recurve. I’m not crazy about recurves in general, but the one on the Utilitac II is inoffensive. And it does make the belly extremely aggressive. Combine this with the excellent overall grind and very competent edge bevel, and you get a great mid-size cutter. The Utilitac II chews through thickish media with ease. Cardboard, foam, plastic – these are the sort of cutting tasks the Utilitac II is made for. In delicate cuts it is less impressive, but by no means bad. AUS-8 is good stuff. Anybody can sharpen it. It ls one of few steels that I feel genuinely confident with every time I take it to the stones. It offers reasonable toughness and reasonable edge retention. High end steels are pretty much all good, but in the budget realm AUS-8 is a good steel amongst merely acceptable ones. And on the Utilitac II, AUS-8 is really allowed to shine. The grind emphasize its good qualities and minimizes the bad. I have no complaints about the steel, and wouldn’t even if the Utilitac II was twice the price. For all the character in the blade shape, the Utilitac II’s handle is comparatively quiet. However, ‘quiet’ does not equal ‘bad,’ and while the handle won’t change your life, it’s certainly acceptable. The finger groove is big enough to be comfortable, and it transitions into the finger guard in a gentle way to avoid feeling cramped. If anything, it reminds me of Emerson’s handle designs – which is no bad thing at all. I find that what material a handle is made of is less important than how well that material is executed. This must be why people hate on the standard Griptilians’ plastic scales but don’t seem as bothered by the Delica’s FRN. The Utilitac II’s plastic scales are done right. The stepped, three layers of texturing are all tactile, and make the handle feel contoured even though they aren’t. I like the visual interest that the faux bolster imparts to the design. Pardue and OKC also nailed the width on this knife. I don’t think that thinner is always better in pocket knives. Sometimes, a design works better if it’s a little thicker, and that’s certainly the case here. The thickness of the handle functions as a counterbalance to the beefy blade, and gives you some exact and intuitive control over your cuts. Of course, there is one way in which the thickness is less ideal, and that’s in pocket carry. As someone who doesn’t really carry anything else in my knife pocket, I don’t mind the chunkiness, but some certainly will. On the other hand the pocket clip, also a very Emersonian design, works well. In the tip down configuration (the way the knife comes), it travels just far enough across the knife to keep it stable in carry. There really is no excuse at this point for pokey deployment on a knife, no matter the price. Obviously corners will be cut on budget knives, but the Utilitac II is yet another argument in the ongoing case that a good pivot is never something that needs to go. A simple phosphor bronze and Teflon washer setup and a punchy detent combine to give the Utilitac II a glass-smooth, lightning quick, and immensely satisfying deployment. You kick off this satisfying deployment via ambidexterous thumbstuds. Another small thing that the Utilitac II absolutely nails is thumbstud placement. Holding the knife naturally, your thumb is exactly where it needs to be to flick the blade open. And once you deploy the knife, your thumb comes to rest exactly where it needs to be the use the knife. It sounds like a small detail, and it is, but anytime a knife can break down a time tax between you needing to cut something and getting that something cut, it should be pointed out and lauded. This big and beefy knife uses a fairly thin liner lock, but one that has been utterly reliable in the four months I’ve owned and carried this blade. There was no play the day I got it. A little horizontal play, easily fixed by tightening the pivot, is all there is to report as I write this review. The liner travels over a fair distance, locking up at about 60%. I know that it isn’t a universally-held belief that early lock up is better, and that some makers favor late lockup on liner locks. I wonder if the late lockup here has something to do with its stability. A generous cutout on the show side scale makes accessing the liner easy. One issue I have with the lock, however, is the jimping on the locking leaf. It’s pretty sharp and can start to irritate your finger if you’re opening and closing the knife a lot. The cutout is so effective on its own that this toothy jimping is redundant anyway, so if they ever updated this knife I’d like to see it go. Judging by YouTube reviews and dusty old forum posts, the Utilitac II seems to have enjoyed a brief time in the spotlight before the knife community moved on to other knives. This is a shame because I would hazard to guess that this knife is outright better than just about any budget offering released this year (besides the Pro-Lite). It’s likely better than any budget knife that came out last year, too. And I’ve never used a RAT 1 but I can’t imagine it being a substantial improvement over the Utilitac II. When it comes to visuals I think Joe Pardue’s design has the RAT 1 beat easily. The number of meaningful variations it’s offered in is also pretty impressive, even years later. If you haven’t tried one, and if you can work with the mid-size EDC philosophy, I encourage you to give the Utilitac II a try. It’s actually a thoughtfully designed knife, and thoughtful design is refreshing at any price point. I don’t think that it’s been officially discontinued as of yet. Either way, it is still widely available, and well worth your time for any price under $40. I recommend purchasing the Ontario Utilitac II at Amazon or BladeHQ. Please consider that purchasing anything through any of the links on this website helps support BladeReviews.com, and keeps the site going. As always, any and all support is greatly appreciated. Thank you very much. A couple things drew me to the Ka-Bar Jarosz Folder. First, Ka-Bar doesn’t release a lot of folding knives. They are a knife company best known for their classic USMC combat knife, and have a reputation for being a traditional knife company with a lot of fixed blade designs. Second, Ka-Bar chose to collaborate with custom knifemaker Jesse Jarosz. Jesse is a maker that I have heard a lot about over the past few years. I have yet to handle any of his designs, so I was excited about the prospect of checking out this collab with Ka-Bar. What’s interesting about Jesse is his unorthodox handle designs and decision to focus on non-flippers. This may not have been remarkable a few years ago, but these days most custom knifemakers are producing flippers. It has gotten to the point where someone producing a knife that is not flipper has actually become novel. It’s kind of crazy when you think about it. His folder for Ka-Bar is based on his popular Model 75. This is a no-nonsense function-over-form design that appeared to be a great candidate for a production piece. With that in mind I bought the knife. The Jarosz Folder has an overall length of 8″, a 3.5″ blade, weighs 5.25 ounces, and is made in Taiwan. This is a brute of a knife, with a thick blade and full steel liners. 5.25 ounces won’t pull your pants down, but it is substantial, and the Jarosz Folder is more of a weekend carry for me. Of course if you can get away with EDCing a bigger and heavier knife then this could be a daily carry. The Jarosz Folder comes with your choice of a drop point or tanto blade. I went with the drop point, as that is my preference, and it seemed to hold truest to Jesse’s original Model 75. The drop point blade is simple. It is ground from near 4mm thick steel, and the blade has a saber grind. The knife came surgically sharp from the factory, which is always great to see. The edge is neat, but peters out a little towards the tip. Ka-Bar finished things off with a coarse tumbled finish. This is a durable blade shape. The thick stock provides strength, while the hollow grind allows it to cut efficiently. Ka-Bar went with Aus8 steel here, which is par for the course for a sub $50 knife. Aus-8 won’t win any edge retention awards, but is fine for a beater blade like this. You probably know as well as I do that Aus-8 is tough, easy to sharpen, and corrosion resistant. It’s a good budget steel and Ka-Bar gives you plenty of it. I have used the Jarosz Flipper to for several projects, and have broken down a fair amount of cardboard with this knife. It slices well, stands up to hard use, and has proven to be a great work knife. The handle is comprised of fiberglass reinforced nylon (FRN) scales over full steel liners. There is a partial FRN backspacer that straddles a lanyard pin. Handle construction is solid, but not perfectly executed. My handle scales were slightly proud of the liners in some spots, and the edges of the scales are rough. It was odd enough for me to post an inquiry about this on BladeForums to see if others shared that issue, or if I was just unlucky. The feedback I received suggested that I was unlucky. Jesse himself was kind enough to post in the thread and recommend that I loosen the screws holding down the scales and nudge everything in place, or send the knife in for service. Adjusting the scales worked, and the problem mostly went away. In retrospect this seems pretty obvious but I haven’t run into the issue before. That said, the edges of my scales still catch the skin of my fingers slightly; especially the scale behind the locking liner. It’s not unpleasant, and it actually provides a little traction. Also, it is not noticeable when using the knife. Once I resolved the issue with the handle scales I began to appreciate the sensible ergonomics of Jesse’s design. This is a funky looking handle, but in practice it works well. The handle shape is comfortable, and provides plenty of space for a wide variety of grips and hand sizes. There is a row of toothy flat-top jimping on the spine of the drop point version, and the FRN handles provide traction without being abrasive. The slightly rough edges of the FRN scales provide additional grip. The pocket clip is an adaptation from the custom knives, and is a spoon style clip with Jarosz’s geometric logo. The clip is right side only, but is allows for tip up or tip down carry. It is uncoated stainless steel, but appears to have been tumbled to make it less shiny. The Jarosz Folder carries OK. This is a substantial knife. I found that the combination of lightly textured scales, heavy knife, and light spring tension of the clip meant that the Jarosz Folder would continually slide down towards the base of my pocket. I mostly wear shorts with V pockets, and prefer to keep my knives higher up on my pocket for concealment and ease of accessing my wallet. This knife required regular adjustment. The Jarosz Folder makes use of dual thumb studs and teflon washers. The blade is heavy and the detent is strong. You can flick open the blade, but it takes a fair amount of force. This is not a knife for the weak thumbed. The action is smooth, but I am not a fan of teflon washers, and would prefer phosphor bronze washers here. I am also not a fan of the decorative pivot on this knife. It’s nice and large, but Ka-Bar does not include a tool to adjust it. I don’t see this pivot on Jesse’s customs, so I don’t know where it came from. The good news is that the blade centering is excellent so there was no need to adjust the pivot out of box. This knife makes use of a stainless steel liner lock. The liner lock is substantial and it engages the blade about 50%. The end result is a sturdy lock free of play in any direction. Initially my lock exhibited a slight amount of stick, but it has broken in and smoothed out over time. This is a solid liner lock. Although I have raised some quibbles about the Jarosz Folder I think the pros outweigh the cons and this is a great work knife. In a perfect world I’d prefer a stronger pocket clip, a pivot with “regular” hardware, and phosphor washers, but when you get this knife in hand and actually cut stuff with it the design really comes together. It’s comfortable like a good pair of leather boots. I may not care for some of the details, but can’t argue with the results. This is also a substantial knife designed to take some punishment. This is a hard use tool, not a slim daily carry, and that is OK if you know what you are getting into. Not every knife needs to be modeled after the Spyderco Delica. The unorthodox nature of the Jarosz Folder is part of what I enjoy about it, but it has also made this a tough knife to review. Despite the Jarosz being unorthodox, I still want to contrast it with some other offerings that sell for around $40. Cold Steel offers the Pro-Lite and Voyager. These are 2 AUS-8 and FRN handled knives that are also tough. The Ontario RAT I is another excellent choice at this price point with similar construction and materials. You can venture into the $50 price bracket and find gems like the Blur and Aus-8 American Lawman. While there are plenty of options to consider at the crowded ~$40 price range, I think the Jarosz Folder will appeal to the right buyer. This is especially true if you are looking for tank like construction. I don’t recommend it if you are looking for a lightweight every day carry. It is not that kind of knife. The execution is not perfect, but the design is solid. This is a successful collaboration, and a good introduction to Jesse Jarosz if you don’t have the coin for one of his custom pieces. Recommended if you are interested in Jesse’s designs, and want a no-nonsense work knife. I recommend purchasing the Ka-Bar Jarosz Folder at Amazon or BladeHQ. Please consider that purchasing anything through any of the links on this website helps support BladeReviews.com, and keeps the site going. As always, any and all support is greatly appreciated. Thank you very much. These days in the world of high value folding knives we have some pretty stiff competition. Old standbys like the Spyderco Tenacious and CKRT Drifter continue to be tough to beat while recent contenders like the ESEE Zancudo, Ontario Rat II, and CKRT Swindle are re-defining what is possible with a low budget folder. 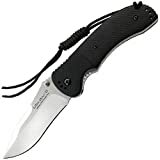 But when you are paying less than $40 a pop there is plenty of room for more, which is why my reinterest in budget blades has led me to the recently released Kershaw Injection. The Injection 3.0 has an overall length of 7″, sports a 3″ blade, and weighs 3.30 ounces. This knife feels pretty heavy for a 3″ blade, but the Injection is still firmly in the EDC camp. For those appreciating a larger knife, Kershaw has thoughtfully decided to offer this model with a 3.5″ blade, aptly named the Injection 3.5. Everyone is a little different when it comes to their ideal EDC blade length, so I think that it is fantastic that Kershaw decided to offer this model in two sizes straight out of the gate. The blade shape on the Injection is a very basic drop point. It may be a little boring, but it certainly works well with its fine tip and full flat grind. This is a very practical choice for EDC. One aspect that I don’t particularly like about this blade is the bead blasted finish. This inexpensive finish is prone to rusting and doesn’t look particularly good. I think it’s a misstep on a knife that is trying to appeal to the consumer based on it’s details, but I guess you can’t have it all at $30. Beyond the blade finish there is very little to gripe about. The steel in this knife is 8Cr13MoV, a staple in low-end Chinese knives that I have spoken about ad nauseam. But don’t let my familiarity with the steel turn you off, I don’t mind 8Cr13MoV when the price is right. It compares well to AUS8 in that it won’t hold an edge forever, but it is durable and easy to sharpen. Despite being a stainless steel it can rust, and my particular knife did stain a little when I left it unattended on a shelf for a few weeks. You definitely want to keep an eye on this steel and apply a little oil if you are looking to maintain a totally rust free blade. All said, for a ~$30 folding knife it’s tough to beat 8Cr13MoV. The handle is where the Injection starts to get interesting. Taking center stage is the full G10 3-D machined handle scales. They feature a tasteful milled pattern and are subtly contoured. Intricately machined and 3-D sculpted handles are a feature often absent on $100 knives, let alone $30 ones, and this is the most impressive aspect of the knife. Further adding to the custom flair is the oversized decorative pivot and milled G10 backspacer with inset lanyard pin (rather than a lanyard hole). These are undeniably great details in a budget knife, and it elevates the Injection from beater blade to something much more interesting. The handle construction is also very solid. There are no gaps or cracks and all the pieces line up well. Underneath the G10 scales are solid stainless steel liners. It makes for a very solid knife, but it does add weight to the little Injection 3.0. In hand the Injection 3.0 feels just a little short. Maybe that is because this is a very straight handle, which means that there is less surface area, but I found my fingers a little cramped. Granted I do take a large glove, so please keep that in mind. I will say that the basic handle shape makes the Injection easy to hold in a couple different positions and I didn’t notice any hot spots. Reverse grip is actually super nice with the angular shape of the pommel, but I can’t say I’ve actually used the Injection with a reverse grip yet. The entire knife is free of jimping which is fine for an EDC knife. This is a relatively thick knife and it fills the hand and has held up under harder use. If I were intending to use this knife for serious work I would opt for the larger version. The pocket clip is simple, but it is also tasteful and well executed. The innocuous triangular clip is sure to appeal to a broad crowd, and it is positioned for decently deep tip up carry. The clip has a bead blast finish which further adds to the discrete look. The clip is swappable for left or right side carry, but fans of tip down carry are completely out of luck. Personally, this is not an issue. For deployment you have dual decorative thumb studs. Despite the interesting milled details on the thumb studs, they are still very easy to access and quite practical. I had no problem flicking the blade open with the push of my thumb. Inside, there are metallic washers that appear to be phosphor bronze. This isn’t the smoothest knife I have handled, but if these are real phosphor bronze washers then the knife will only get smoother with time. For lockup you have a sturdy stainless steel liner lock. My knife locks up 100%, but is free of any play. The liner lock is also easy to disengage and doesn’t stick. The full G10 scales and full stainless liners make for a robust knife that inspires confidence. Blade centering on my knife is favors the non-locking side, but it doesn’t rub and is acceptable for a knife of this price point. The Kershaw Injection is a solid attempt at a value folder with some high end details. The 3-D machined G10 scales, decorative thumb studs and pivot, and G10 backspacer are all high end finishes more commonly found on a custom knife than a Chinese production blade. But the off center blade, stiff pivot, and bead blasted finish bring us back down to earth. I also was not a huge fan of the weight and cramped feel of the handle. These are all minor gripes, and I realize you can only do so much with a budget knife, but I feel obligated to say something. 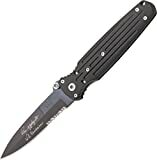 While I like aspects of the Injection 3.0, it doesn’t make my list of recommended budget knives. There are definitely knives I prefer over the Injection at this price point. Still, the effort Kershaw put into this one is apparent and the Injection is certainly capable as an EDC. 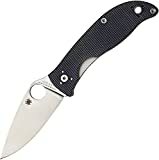 The fact that I am even nit-picking a $35 folder shows that we are truly spoiled to have so many interesting and high quality budget blades at our disposal. Ultimately, this is a decent buy at $35 and I recommend it to fans of the design. I recommend buying the Injection at Amazon or BladeHQ. Please consider that purchasing anything through any of the links on this website helps support BladeReviews.com, and keeps the site going. As always, any and all support is greatly appreciated. Thank you very much.